Thirumoozhikkalam/Lakshmana Kshetram is one of the 108 Divya Desams of Lord Vishnu located in Eranakulam District, (Nedumbassery Airport) Kerala. 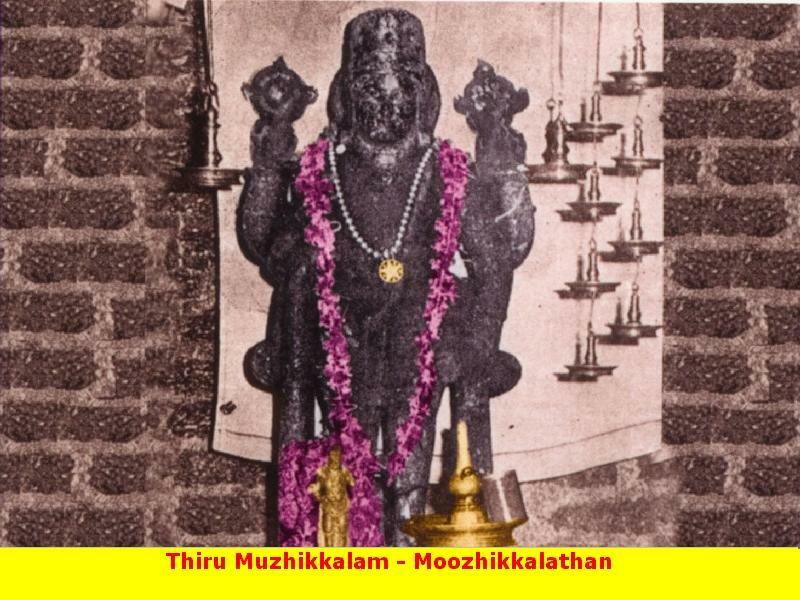 Located about 30kms North West of Ernakulam Railway Station is the Moozhikalathan Divya Desam in Thiru Moozhikalam. The temple dates back to the Ramayana period and is a temple dedicated to Lakshmana. This is one of the 108 sacred shrines of Lord Vishnu where Lakshmana and Bharatha worshipped together. It is said that Lakshmana built the Tower and Mandaps of the temple. The legend has that Lord Krishna worshipped the idols of Lord Rama, Lakshman, Bharatha and Shatrugna at his palace in Dwaraka. The entire Dwaraka was submerged in the ocean; but the idols were safely lingered in the hands of Sage Vakel Kaimal. On that night Lord Krishna appeared before the Sage and instructed him to sanctify and install these idols on the river banks of Bharathapuzha. The idols were installed as per the instructions of Lord and these temples were come to known as Lord Rama Temple at Triprayar, Bharatha Temple at Irinjalakuda, Shatrugna Temple at Payamallil and Lakshmana Temple at Eranakulam. Lord Rama with Goddess Sita and Lakshman lived in Chitrakoodam during their exile from the Kingdom Ayodhya. Bharatha came to know about the painful incident of Lord Rama’s exile and became inconsolable. He hurried to Chitrakoodam to meet his loving brother and pleaded him to return to Ayodhya. Lakshmana who was always vigilant stood beside Lord Rama miscalculated the unexpected arrival of Bharatha and was mentally prepared to fight against him. Later, Lakshmana felt guilty after witnessing the boundless affection of these two brothers, he lamented at his thought and arrived on this sacred land to get rid of the sin. Another legend has that Sage Haritha underwent severe penance praying to Lord Vishnu on this sacred land. Lord was pleased at the devotion of the Sage and appeared before him. Sage Haritha earnestly prayed to Lord to suggest an easiest way to attain salvation at this era of Kaliyuga. The compassionate Lord Vishnu advised Sage that, whoever follows Varnashrama Dharma, performing their duties and responsibilities prescribed in the sacred scriptures, whoever follows righteous life and engages in the self-less worship of Lord would attain Salvation. Further, Lord Vishnu described the essence of Veda and Vendanga (Sri Suktham) to Sage Haritha on this sacred place. Festival: Besides special pujas and abisheks to Lord in all Tiruvonam star days of the year, Chithirai Tiruvonam (April-May) Aarattu festival is celebrated grandly with a flag hoisting ten days earlier. In Kerala, as Aadi month (July-August) is considered as Ramayana month, devotee crowd is huge in the temple during this month. This is about 32kms from Ernakulam Junction.Will take about 1 hour by car/auto. 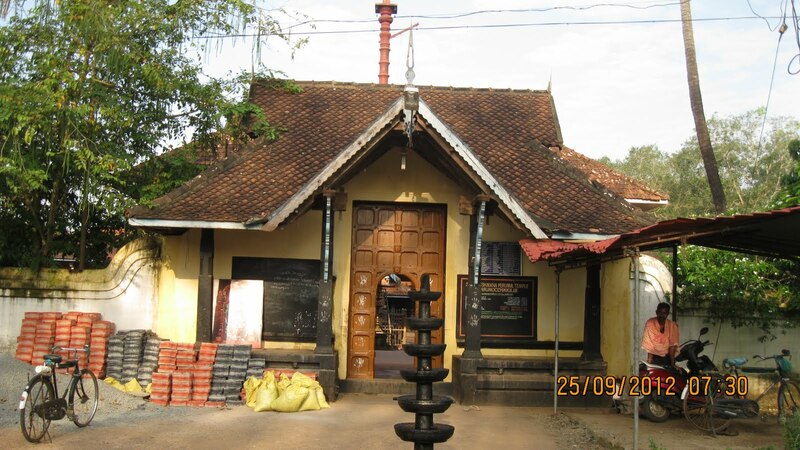 There are buses from Alwaye(Aluva) to this temple. One can also get down at Alwaye Railway Station to reach this Divya Desam. .